When I need to check some data, such as returns and historical prices, of stocks or mutual funds, I usually use free tools such as Yahoo Finance or Morningstar. For my simple needs, those tools are enough, though what they offer are quite limited. Recently I was informed about another free stock analysis tool, the Instant Stock Analysis from INO (as I Know ). The tool is quite easy to use. 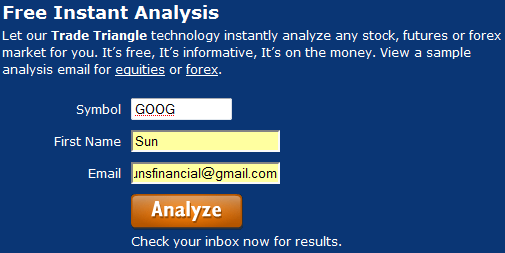 To analyze a stock, you need to enter the symbol of the stock you are interested in (I use GOOG as an example), then your name and email address. After waiting for a while (sometimes the wait could be quite long), the free analysis is delivered into my Inbox, which looks like the following. The report contains a score, developed based on pre-defined weighted formula for the Smart Scan Chart Analysis. The report also gives a short-term trend for the stock (Weak Downtrend for GOOG). Of course, the formula and the score are all developed by INO. If you use a different tool, you may have a different result, depending on what and how elements are weighted. In addition to receiving the analysis report in email, you can also view it online by providing your email address (the one your provided when requesting the report). For the online version, you can play a little more with the chart. I am not a heavy stock trader, so I am still trying to figure out exactly how to use the tool to improve my trade (hope it can ). 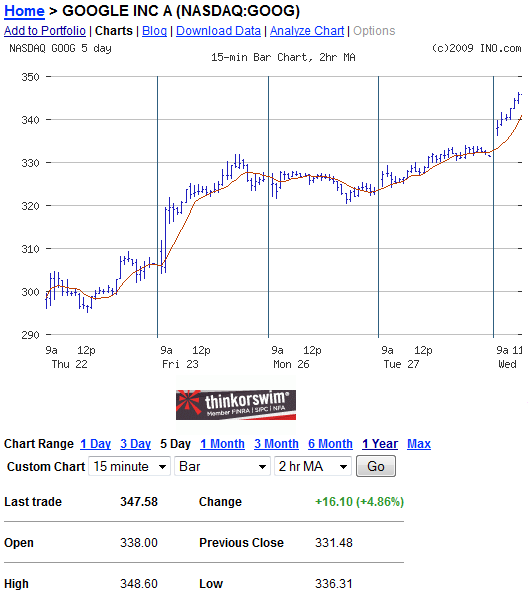 What do you think of the Instant Stock Analysis tool? Check it out to see whether you like it or not. If you are an experienced trader and looking for other tools and resources to improve and further educate yourself, you probably won’t be satisfied with the free analysis tool. If that’s the case, then INO also have a premium service called Market Club, which is a paid service but much more comprehensive and with more benefits. 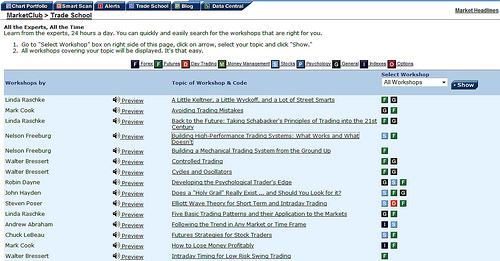 For example, with the free Stock Analysis, you will receive one report with trend analysis when you request a report. Market Club members, on the other hand, will receive daily trend analysis report. From the above screenshot, you can see that you can actually download the data or do further analysis, both functions are available for Market Club members. For the data download function, you will have the option to download the data in four different formats: from 1 Minute to Daily (click the following picture to enlarge for a better view). To keep you up-to-date with your stocks (or your entire portfolio), you can use Market Club’s Smart Alert tool to send you email alert when an event is triggered. For example, you can set alert for your stock when Price Breakout Above, Price Breakout Below, Chart Analysis Up, Chart Analysis Down, or when the stock reaches a high or low (1 week, 3-week, 4-week, or 52-week). And with Market Club’s Smart Scan tool, you can scan hundreds of stocks meeting certain criteria (click to enlarge following picture for details). Finally, Market Club also offers members seminars and workshops on Forex, Option, and Stock trading, as well as other training and educational programs. I’ve never used INO for stock research but I’ve just tried it and it looks fun. It isn’t anything you can’t do yourself but is perhaps a good way to get your geet wet. Though it should be noted the tools you’re using are strictly for technical analysis. I’m not big on technicals, more of a fundamental value seeker myself. Maybe you could put something together about fundamental investing.